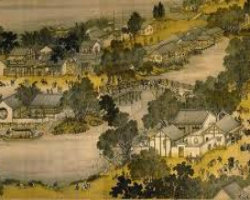 Along the River During the Qingming Festival (清明上河图, Qing Ming Shang He Tu, Xiao, 箫) was composed of the famous painting in the Song Dynasty painter Zhang Zeduan(张择端). Along the River During the Qingming Festival ( 清明上河图) is a painting attributed to Song Dynasty artist Zhang Zeduan (1085–1145). It captures the daily life of people and the landscape of the capital, Bianjing, today’s Kaifeng, from the Northern Song period. The theme is often said to celebrate the festive spirit and worldly commotion at the Qingming Festival, rather than the holiday’s ceremonial aspects, such as tomb sweeping and prayers. Successive scenes reveal the lifestyle of all levels of the society from rich to poor as well as different economic activities in rural areas and the city, and offer glimpses of period clothing and architecture.